TEAMORIGIN challenge America's Cup factions to state their motivation - court or sport? With the America's Cup seemingly helplessly embroiled in courtroom bickering and semantics, a surprise move by TEAMORIGIN has proposed a 'third way'. The team have proposed their candidacy as challenger of record, to negotiate a protocol agreeable to all & based upon the original AC33 proposal, with the final to take place in Valencia in 2011. The action is an attempt to provide a means for Société Nautique de Genève (SNG) and Golden Gate Yacht Club (GGYC) to end hostilities long before any protracted New York Supreme Court resolution, while affording both sides a face-saving opportunity. With all parties claiming to have the cup's best interests at heart, it's an opportunity to prove the purity of their intent; at the same time, to disregard such opportunity may well once and for all reveal non-sporting motivation behind current activities; the ball is (as is so often the case) firmly in SNG's & GGYC's respective courts, pardon the pun. The Afterguard believes that the opportunity to see a broad field compete for a 33rd America's Cup can only now be achieved by compromise, and although far from perfect, this TEAMORIGIN assertion will once and for all answer the question 'is it really for the sake of the sport?'. Can either party, subject to current court scrutiny, afford to disregard a viable alternative? Certainly TEAMORIGIN have now been seen to propose a solution with guidance from former ACM-man Marcus Hutchinson, TEAMORIGIN's Director of External Affairs & Communications - a man ideally qualified to know which bullet Ernesto Bertarelli might bite. TEAMORIGIN and the Royal Thames propose a "Third Way"
On 9th January this year TEAMORIGIN, with the Royal Thames Yacht Club (RTYC), lodged a Deed of Gift (DOG) Challenge with the Société Nautique de Genève (SNG). It called for a Match in 2011 in Valencia to be sailed in AC90 yachts and it outlined their willingness to consider a mutual consent match with a protocol along similar lines to the one signed in July last year. The RTYC’s most recent challenge was lodged in anticipation of a potential vacuum occurring should the currently disputed Golden Gate Yacht Club’s (GGYC) DOG Challenge be found lacking by the New York Supreme Court’s Judge Cahn. SNG’s motion to reargue and renew points about the validity of GGYC’s DOG Challenge, part of the legal dispute that has dogged the America’s Cup since July 2007, was due to be heard on 14th January of this year, along with argument on settling the order arising from the judgment of 27th November. On 14th January however Judge Cahn further postponed the hearing to Wednesday 23rd January. “We are in favour of your original philosophy for the 33rd America’s Cup, the pillars of which came through clearly in the July 2007 Protocol, namely a mutual consent regatta, based in Valencia, with pre-regattas and sensible cost containment…”. The delay in Judge Cahn’s deliberations last week has opened up a second potential benefit from the RTYC’s new challenge. It could now also help secure a new trial protocol with the Swiss Defender that is sufficiently satisfactory to the GGYC for the American club to be sufficiently comfortable to drop its challenge, making way for the RTYC to become the Challenger of Record. This should result in the avoidance of the inevitable appeals threatened by both sides should they lose in the current litigation. It should also negate the need for a DOG Match some time this year or next, with the serious complications that the potential of such an event is starting to bring to light. By following the lead proposed by TEAMORIGIN and the RTYC the GGYC and the SNG have a real opportunity to reach a successful conclusion to the current situation, stop building yachts for a DOG Match, avoid further litigation and allow stability to return to the world of the America’s Cup - something that would benefit all prospective challengers and the sport as a whole. To ignore this opportunity would result in further untold damage and could lead to a potentially hollow victory, completely debasing the value of the America’s Cup as the pinnacle of the sport of sailing and stunting its ability to further develop in the future. “We believe that a real window of opportunity exists to end this situation positively and quickly. And so we call on the GGYC and the SNG to take this new opportunity seriously and work with us on a new protocol for an America’s Cup in 2011 in the exciting new AC90 class,” concluded Sir Keith. Royal Thames Yacht Club notice of challenge may be downloaded here. The Afterguard would like to take this opportunity to wish all our readers a very Merry Christmas and a happy and peaceful 2008. 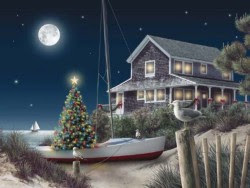 To those at sea throughout the festive season we wish safe passage. To the crews and shore crews of America's Cup teams we wish a successful and positive New Year. In particular, we hope the fortunes of all involved with TEAMORIGIN take a beneficial turn in the year ahead. To the protagonists responsible for the mess they've left the cup in, we hope they'll take a little time over the holiday season to reflect on their actions in recent months, and perhaps strive to do a little more for the common good as we move into the new year. We remain hopeful for the opportunity to return in 2008 and cover America's Cup sporting activity, once and for all to banish the bitter after-taste of apparent America's Cup malfeasance we've all suffered recently. Let's hope we'll soon remember 2007 for the excellent 32nd America's Cup alone. Image: Art by Alan Giana. TEAMORIGIN this afternoon acknowledged that no multiple-challenger America's Cup competition is likely to take place before 2011. Careful to temper language when reflecting on the shambolic state of mismanagement that the America's Cup is in, there is little doubting the disappointment behind the team principle's pledge to try to keep TEAMORIGIN together over the next four years. Having witnessed the effort that has gone into generating the cohesion and ambition driving all members of TEAMORIGIN, The Afterguard wishes to extend its best wishes to all concerned for the future. TEAMORIGIN, Britain’s Challenge for the America’s Cup, is modifying its plans to aim for competition in 2011. Originally planned for 2009 this date is now seen as the most likely date for an America’s Cup event with multiple challengers. “Over the past 12 months Team Director Mike Sanderson and I have assembled what we believe to be an incredibly strong team in TEAMORIGIN. Today that team is made up of over 100 people and numbers amongst them the best sailors, designers and shore side management in the business. With the work accomplished so far we were on track to race the new AC90 class competitively for the America’s Cup in 2009. However, our assessment now is that a 2009 America’s Cup Match that TEAMORIGIN could compete in is extremely unlikely and that 2011 is now the most likely timing for the next America’s Cup with multiple challengers,” explained Team Principal Sir Keith Mills. “Up until today the design team, run by Juan Kouyoumdjian, Andy Claughton and Mickey Ickert, had been working flat out to design the first of the team’s AC-90 yachts. TEAMORIGIN’s shore crew and boat builders had been making all arrangements to build this boat in time for a June 2008 launch in Valencia. We now see a longer period ahead of us before a race-ready yacht is required and so have taken this opportunity to change our approach. To keep these original plans in place now would be wasteful and as a result TEAMORIGIN is lowering its current level of activity and re-focusing on planning for a 2011 event. The team is however always prepared for any eventuality and it has the flexibility to quickly escalate the programme and plans in case the America’s Cup situation changes again,” said Team Director Mike Sanderson. When Sir Keith Mills first announced his intentions to challenge for the America’s Cup 11 months ago it was without knowing the dates, venue or format of the first event a British team could race in. Although initially expecting to be able to race in the 33rd America’s Cup, announced in July of this year to be run in 2009, the ongoing litigation between the Swiss Defender and San Francisco’s Golden Gate Yacht Club has brought into question the dates and format of the next event. “The greatest thing that I found have about TEAMORIGIN during its formative months has been the spirit in which a really strong and competitive team has been created. We have an incredible array of motivated talent in this team, people who want to do this for the right reasons. Although, through lack of an event, we have to slow down now in our preparations I know that when the time comes this team will regroup and come out even stronger,” said TEAMORIGIN’s skipper Ben Ainslie OBE. Alive & well, The Afterguard remains silent for good reason. We at The Afterguard are grateful to all who have emailed us over recent weeks to check that all is ok with us and to enquire as to why we have been silent. To be honest, our initial enthusiasm for the machinations behind the scenes of the America's Cup have turned over recent months to utter contempt for those responsible for turning a once honourable sporting event into a circus whose only currency is greed and arrogance. Such is our disregard for those involved that we'd rather deny the oxygen of publicity to these parties on our pages; there are others who are more eloquent in their reporting of the self-inflicted humiliation being played out - we'll remain silent and maintain a watching brief, ready to return just as soon as sportsmanship is ready to replace selfishness. Here's to the hope of some sport in 2008. TEAMORIGIN, Great Britain's entry for the 33rd America's Cup have signalled their intent by winning their first competitive challenge - The Grade 1 ISAF Trapani Cento Cup. TEAMORIGIN, Britain’s Challenge for the 33rd America’s Cup, competed at the Trapani Cento Cup, a Grade One ISAF Match Race Regatta in Trapani, Sicily, at the weekend and won. Against a star-studded line-up of skippers from the last America’s Cup, including the two Danish helmsmen Jes Gram Hansen and Jesper Raddich, the Australian James Spithill and the Italian Paolo Cian, TEAMORIGIN’s Ben Ainslie, Iain Percy, Matt Cornwell and guest Gabriel Bruni competed in and won the 2007 Trapani Cento Cup. Trapani, on the extreme western tip of the Italian island of Sicily, was the site of Acts 8 & 9, a pair of build-up regattas for the last America’s Cup sailed in full size America’s Cup Class yachts in October 2005. “This was our first international competition sailing together, our team worked well together and developed well as we went through the regatta. Sailing with Iain worked really well from a tactical point of view and this result is an important step forward for us” commented skipper Ben Ainslie. “The conditions were pretty straight forward for the Round Robin series starting last Thursday, we sailed outside the harbour on open water. For the semis and finals at the weekend however we raced inside Trapani Harbour, which made it very shifty and really called for ‘heads-out-of-the-boat sailing’ to spot the wind,” Ainslie continued. “I am particularly pleased with this regatta not only because the team won, which is great, but because Ben and Iain worked really well together tactically. This is an important signal for TEAMORIGIN’s future. We are a new team with experienced people coming from different backgrounds. This first test of getting this small but important part of the team working together has gone well,” concluded Team Director Mike Sanderson. As a consequence of the uncertainty and the delays arising from the Golden Gate Yacht Club Law suit in New York, AC Management (ACM) is concerned that the feasibility of organising the next America’s Cup in Valencia in 2009 has been effectively compromised. ACM will in the coming days engage in consultations with the Defender, the Challenger of Record, the Competitors and the Spanish Authorities on this specific matter. ACM is considering all options, including the possibility of postponing the event to a later date. In the meantime, ACM understands that SNG continues to try to find a resolution of the dispute pending with Golden Gate Yacht Club in New York. Regarding the press release issued today by ACM in which declares its concern about the “the possibility of postponing the event to a later date”, Desafío Español states its unconditional support to the Spanish and Valencian authorities, the Defender and the Organisation of the America’s Cup. Desafío Español understands that the organisation of a sporting event of this magnitude must be done without haste and under the best consensus atmosphere between all the parties involved. For this reason, Desafío Español shows its conformity with the proposed conversations between ACM, the Defender, the Challenger of Record, the competitors and the Spanish Authorities in which Desafío Español will participate actively. Desafío Español also hopes that, as a result of these conversations, the 33rd America’s Cup can be celebrated in the initially proposed dates. Meanwhile, Desafío Español continues working towards the next edition of the America’s Cup, configuring the structure of the team and developing its plans. To many of our readers it might seem a simple enough thing to do, but there are days when keeping The Afterguard abreast of happenings in the America's Cup is just plain arduous. "It is wonderful for Miss Muti to partake of this event - It flatters her and she is so happy to be involved - how could she say no to an all-female challenge like this? The colour of the event inspires me!!! She is deeply in love with this project and will be doing everything to be useful to the team"
Having felt we might have been a little too light-hearted in our approach, we ended our piece by reflecting that we had made previous efforts to gain more information from Fuxia Challenge, and asking that if Paolo Rivelli should read our article, would he care to contact us. Paolo has been the sole individual we have noted to be associated with much recent Italian media coverage. By the wonders of the internet, Paolo has been in touch, and provided us with an English response to a number of our questions. We're grateful to Paolo for struggling with The Afterguard's native tongue - our over reliance on Google translation can render Paolo's melodious language almost incomprehensible! "The idea of Fuxia Challenge was given birth by Sport Xtension, a firm specialized in the development of creative concepts for the sports industry and a company of which I am CEO." 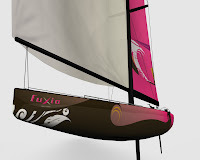 "An international team of marketing, media, finance and sailing experts have worked together to realize this; in the specific this project is born by an intuition of one of the most important & skilful sports & marketing practitioners in Italy, Marcel Vulpis, who is also the President of Fuxia Challenge." "Our aim is to create an innovative approach to the America’s Cup, that basically will promote greater value for its strategic partners through a specific target audience. Fuxia Challenge will assemble an entirely female team from among the world’s top ranking sailors for the first time ever in America’s Cup history; it will be the Challenge of Marketing to Women, heavily orientated to fashion and glamour." The Afterguard had noted mention of Italian & internationally famed actress Ornella Muti in a recent Italian press article, and we asked Paolo to explain her involvement with Fuxia challenge. "Miss Ornella Muti accepted to be the Patroness of the Fuxia Challenge as she is a strong supporter of efforts to improve the status of all women around the world. Fuxia Challenge will be linked to an international charitable organization that is also engaged in this aim." 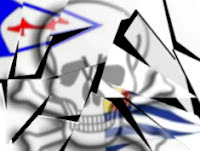 We asked Paolo to comment on some of the female sailors being associated with Fuxia Challenge in the Italian press, and he confirmed that those identified were the subject of mere speculation, as are the yacht clubs thus far connected to Fuxia in the media. "At the moment I cannot confirm any of the statements regarding the team's members currently signed. The team will be announced after the first half of October following confirmation of Fuxia Challenge's Yacht club." "Our deadline to officially announce our participation in the 33rd America's Cup is the 31st of December... and will depend on securing sponsorship to meet our budget of €55/60 Million." We were relieved to have confirmation from Paolo that the team intends to have a female skipper, despite Italian media suggestions of different needs, which turned out to be "more a taunt of a journalist than a serious idea". We believe a number of Italian sailing forums will be suitably relieved also! "On the 19th of September 2007 we launched a co-marketing operation together with an Italian Volleyball club, Prisma Taranto; the rules of the game allow the sweeper to wear a different shirt from the rest of the team and the event was a press presentation of the Fuxia Challenge shirt that the Prisma Taranto sweeper is going to wear during official matches in the Italian Volleyball premier league. 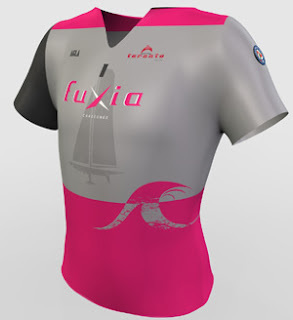 The shirt promotes Fuxia Challenge but is not representative of the official uniform of the Fuxia Challenge Team." There is a stronger connection between Fuxia Challenge and Prisma Taranto than first appears, more of which will become evident in the future; presently Fuxia Challenge will benefit from the international exposure through outlets such as the Sky Sports network that the exciting Italian Volleyball league generates. This will come as welcome news to one friend of The Afterguard's who, on publication of our original article, pondered on the fact that the garment illustrated appeared tailored for the male form. Mystery solved, Trevor! Finally, The Afterguard asked Paolo to reflect on the reluctance by much of the media (ourselves included) to accept the serious intentions of those behind Fuxia Challenge. "I believe that most of the reluctance to accept the concept of Fuxia Challenge is due to its innovative approach that breaks the traditional attitude of the world of this America's Cup, indeed this team intends to revolutionize the way the Cup has been perceived to date." "More than someone’s dream or a design project, Fuxia Challenge is much more real than you could think; it is an initiative with an innovative approach, a media platform that will allow the interested parties to have direct contact with a specific target audience, the female consumers, that is much wider than just the enthusiasts of this sport, to maximize the return on investment. Isn’t that what the AC Management and the corporate sponsors that invest in this event are looking for?" The Afterguard's heartfelt thanks go to Paolo Rivelli, Institutional Relations Director of Fuxia Challenge, for his time and answers. We hope Paolo and the team will keep us up to speed as to the progress of Fuxia Challenge, a very different America's Cup team. Welcome to The Afterguard, featuring coverage of all things sailing, with particular emphasis on the world of the America's Cup and Great Britain's entry, TEAMORIGIN. We're a small and entirely independent blog. 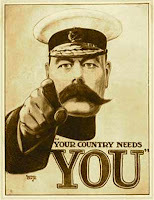 As a blog, this site really does depend upon readers leaving comments, so go on, drop us a line! Who represents the greatest threat to the future of the America's Cup? ... while for others, it's only just begun. We operate an interest-specific link exchange policy, so get in touch! The Afterguard is most grateful to all the talented photographers, photo-journalists & agencies who provide their support in our wish to become a site of record for the GBR entry into the 33rd & 34th America's Cup, TeamOrigin. In addition to individual credits, this list details those whose help has made The Afterguard what it is today - we thank you! & of course, not forgetting our friends at Team Origin & Pitch PR. If you know of or own any other images relating to TeamOrigin, we would be most grateful to hear about them at our email address below - thank you. Words: © 2007 The Afterguard, E&OE. All product names and trademarks are the property of their respective owners. Except where otherwise noted, this work's writing is licensed under a Creative Commons License (expressly not including all images, for which copyright remains with respective owners). The Afterguard is not responsible for the content of external internet sites. The Afterguard is a non-profit independent blog and is not intended to infringe upon the rights of any holders of copyright. Whenever it is realistically possible to identify the sources of images used, we undertake to provide full credit & link to the site of origin. We have already made regrettable errors in assigning credit, for which we unreservedly apologise. In the event anybody feels that their copyright has been violated, please contact us at editor[at]ac-afterguard[dot]co.uk, and we will make corrections or introduce appropriate credit as directed. If requested to do so, your pictures will be removed. 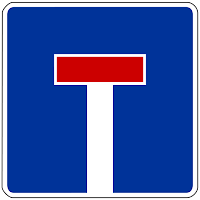 All visual elements are used for illustrative purposes only. They may not be copied or downloaded for any purpose without the permission of their copyright holder.